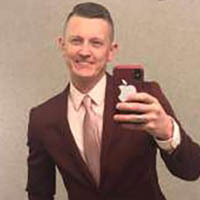 Jared Wayne Martin, 34, of the Hoges Chapel Community, Pembroke, unexpectedly departed this life Sunday morning, March 24, 2019 in Blacksburg. He was born at Giles Memorial Hospital, Pearisburg, on November 30, 1984. Jared was a well known organist, pianist and vocal talent in the New River and Roanoke Valley areas. His talent touched all who heard the melodies that arose from the keyboards. His ability to bring individuals together to make one beautiful voice was a gift that he shared openly. Jared was a member of the Church of Jesus Christ of Latter Day Saints in Pembroke. His testimony of the Gospel and the Savior’s atonement never wavered. Jared attained the rank of Eagle Scout and Order of the Arrow in 2001. He graduated from Giles High School in 2002 where he learned so much about music and life from his beloved instructor, Larry Marion. Jared earned two Associate Degrees while attending New River Community College and was recently accepted in the Music Therapy and Performance program at Radford University, which would have started in Fall of 2019. It was Jared’s desire to help recovering addicts with music as this was an important part of his own recovery. Jared will be remembered for his infectious laugh, winning smile and sense of humor. He had a gift to lift up a person or group with his gifts. He loved listening to uplifting organ and symphony arrangements and the Mormon Tabernacle Choir; you could always count on his radio playing these. Jared had great style in what he wore, you could bet that his shoes were always polished, his suit always pressed, and his hair perfectly fixed. He knew and loved everything about cars and loved working on the farm with his PaPa Wayne. Jared was preceded in death by his brother Jacob Harrison Gentry, his grandparents Jean and W O (Bill) Gentry of Rich Creek, his beloved great-grandmothers “GG” Love Martin, and “Nanny” Mary Porterfield, his two great-grandfathers Earl “Kit” Porterfield and Alma David Martin. Jared leaves to cherish his memory his parents Jeanine and Eric Gentry of Kow Camp Road, Pembroke; a beloved sister Shared Gentry and his most special grandparents Pat (MaMa) and Wayne (PaPa) Martin of Doe Creek with whom he lived; an uncle Ashton Martin also of the home, his Aunt Linette and husband Michael Christley as well as his cousins Michael Wayne and Lauren, Emma Leigh and Jonathan McCollum, Walker and Breanna Christley; he also leaves numerous great Aunts, Uncles, Cousins, and many far reaching friends including , but not limited to Marsha Evans, Dana Daniels, Sharon Wilson and Robin Womack. Funeral services will be conducted Friday March 29 at 4:00 pm in the Church of Jesus Christ of Latter Day Saints in Pembroke. The family will receive friends at the church two hours before the services. Burial will be in the family cemetery near the homeplace directly after the services.